Yet detailed maps of Panama have been around for thousands of years, well before the birth of Christ. In fact, they were situated alongside roads to help travelers along their way – but they were a bit too large to stuff in a pocket. 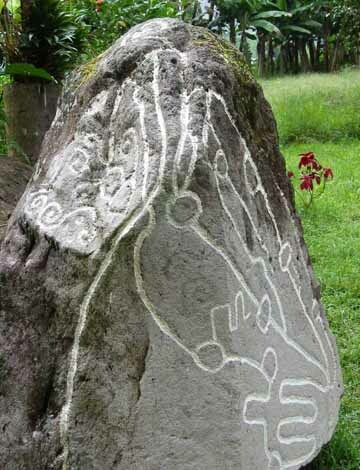 They were etched into rock, similar to the one pictured above. 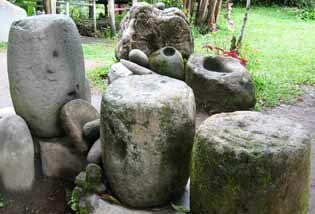 It is at Sitio Barriles (Barrels Site), about 6 km from the village of Volcán. Sitio Barriles is well worth a visit. This map is estimated to be around 2,600 years old, and portrays much of what is now Chiriqui Province using Volcán Barú as its center. Spirals on maps of this type represented volcanoes. Volcán Barú is at the top of this rock. The line extending from it toward the bottom left corner represents the mountain range running the length of Panama, like a spine. To the left of this line, the country drops toward the Atlantic, to the right, toward the Pacific. Other lines represent routes between communities, represented by circles. Just below the center of the picture, looking like crenellations in a castle wall, is a symbol translated to mean "ceremonial place". It, and the circle accompanying it, marks what is now called Sitio Barriles on what must be one of the heaviest maps of Panama. 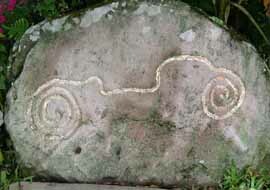 On another side of the same rock is a hieroglyph showing a serpent guarding the ceremonial place. The site is on the farm of Edna and Luis Landau and is open to visitors. Mrs. Landau speaks English and is a tireless guide, explaining each detail of these maps of Panama, and the hundreds of other artifacts. She does not charge for her services, but gratefully accepts contributions to the upkeep of the private facility. Her family has owned the land for about 100 years, and started finding artifacts when it was first plowed. Interpretation of the hieroglyphs was not difficult. The same symbols were used in North Africa as recently as 100 years ago, and Mrs. Landau said they are still used in some South American Indian communities. Another large rock among the maps of Panama shows the route between Volcán Barú (inactive for 500 years) and the extinct volcano Tizingal. Sitio Barriles gets its name from barrel-sized stones that may have been used as rollers for moving heavy objects, as was believed to be the case at Stonehenge in the UK. Another theory, given credence by the slight hollow on top of one of them, is that they may have been used for resting the heads of those to be executed. Beheading is believed to have been a common form of execution, as at least one statue, now in a museum in Panama City, suggests. The statue, some six feet tall, shows what is presumed to be a chief with a head in each hand. The photograph on this page is a faithful clay replica of the original. But the original sculpture begs more questions than it answers about the people who still lived here 2,600 years ago. The man being carried has Oriental features and a conical hat. The man carrying him has African features. Where did these people come from, and where did they go? They were long gone before the Aztecs occupied the same land 1,000 years ago. Did the makers of the ancient maps of Panama have slaves?